We're never getting a Planet Hulk movie. 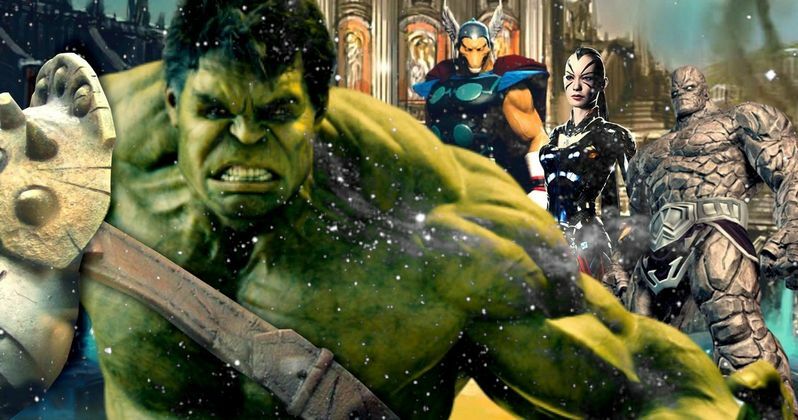 Instead, we're getting Thor: Ragnarok, which will incorporate some of Planet Hulk's iconic comic book storyline. And that continues to be evident as director Taika Waititi confirms the presence of another key Marvel character who played an important role in the Planet Hulk plot. This past week, shooting wrapped on Thor: Ragnarok. To celebrate, the director conducted a Facebook live video, which you can see in the embed below. Here, he takes fans on a whirlwind tour of the set, which he describes as a 'sci-fi space wasteland'. He also brings in stars Chris Hemsworth and Tessa Thompson for some fun. But it's the reveal of a previously unannounced character that has Marvel fans' hearts aflutter. As it stands, Universal Pictures still holds the distribution rights to Hulk, which means Marvel isn't doing a standalone Bruce Banner movie anytime soon. Instead, they are merging the Ragnarok comic arc with that of Planet Hulk for something that will be wholly original. One thing that has been confirmed is that it will see Hulk and Thor in the galactic gladiator ring, with Hulk's armor shown off at this year's Comic-Con in San Diego. Eleven minutes into the Facebook Live video from earlier this week, Taika Waititi introduces an actor named Steve, then drops the bombshell that Steve is actually playing Miek. Though fans of Planet Hulk will notice one startling difference between this version of the character and the one in the comics. This Miek is human. In the comic books upon which these Marvel movies are loosely based, Hulk has been banned from Earth by the Illuminati. That accounts for his absence in Civil War. Banner, in his exile, finds himself on the planet Sakaar, where he becomes friends with Miek, and the two fight gladiator battles for Sakaar ruler The Red King. No cast member has been announced as The Red King, so it's believed that this particular Marvel character won't be showing up in a substantial role. In the comic books, Miek is insectoid in nature, a native of Sakaar. His family and hive have been destroyed by the local army. He was captured by The Red King, enslaved, and forced to become a gladiator. Hulk and Miek team-up for their big escape, with Miek following Banner back to earth, where the pair plan to deal with the Illuminati. No synopsis or plot details have been released for Thor 3 yet. It's unclear how this plot from the comics will be changed or altered. Or whether or not Hulk, played by Mark Ruffalo, and Miek will show up in Avengers: Infinity War to teach Tony Stark and Stephen Strange a thing or two. It has previously been teased by both Kevin Feige and Benedict Cumberbatch that the Illuminati will slowly be introduced in the Marvel Cinematic Universe, starting with Avengers: Infinity War. It's possible that the third Avengers sequel is planning to utilize some of this existing story telling. But we can assure you, it's not going to play out like it does in the comics. Here's the Facebook Live video in case you missed it earlier.